The problem usually happens because your router can't handle too many connections at once. 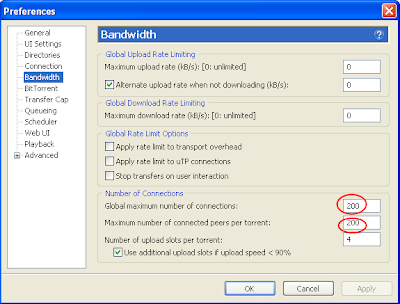 Bit torrent programs like uTorrent open many connections at once to get total high speed in transfers. Every router has its own limits to the maximum connections it can handle. Set your P2P client to a very low amount of max connections in the settings. start by setting both values to 25 and then download some popular file (just one). now wait a few minutes see the connection is stable and then add 25 more to both settings above (while the download still continues) and re-check your connection download stability by waiting a few more minutes. once you get a disconnections go back to the previous setting you had (if it disconnects at 200, then set it back to 175). I found that my router, tplink WR641/2, can probably handle around the 200 connections. Remember you have other connections in the house, including other computers/cellphones on the same router and the same computer browsing the web... so leave enough for everything. "Includes Windows Vista and Windows 7 drivers (for both 32 and 64 bit) for the DVC 100, 101, 103, 107 hardware NOTE: DVC130 and DVC170 don't have 64 bit drivers and can only be used with Windows XP and Windows Vista 32)"
very very hard to download - always download stops. pinnacle capture hardware is really bad quality even on xp i had so many problems with it - i have it now for 5 years and i really never managed to operate it without it crashing my operating system. After too much time waste for this issue, there is a trivial solution that many ppl miss. Response.Clear() / ClearContent() / ClearHeaders(), like many web solutions show you - but don't work !